Jennifer Lasher APRN - Welcome to Shelby Pediatrics - A piece of home for your children, a peace of mind for you. 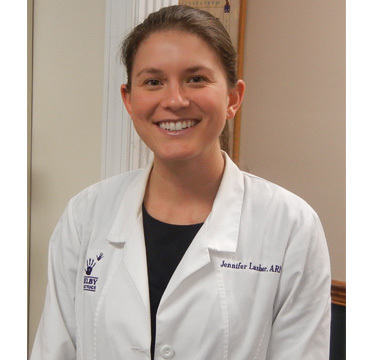 Jennifer, originally from Evansville, Indiana, graduated in 2007 from the Purdue University School of Nursing. She then received her Master of Science in Nursing from Vanderbilt University. She currently lives in Louisville with her husband, Curt, and her bulldog, Champ. Jennifer fell in love with delivering medicine during her time in Nursing School at Purdue. She enjoyed the opportunity to teach others about illness, disease, prevention, and treatment. She wanted to take on a more advanced role in the nursing profession which is why she became a nurse practitioner. Her passion has always been in helping children. She is a member of the professional organization NAPNAP, and places her professional focus on new ways to keep children safe and to prevent obesity in our youth. Outside of Shelby Pediatrics she enjoys traveling and spending time with her family.